Egypt faces such enormous economic difficulties that tremendous efforts are needed for it to reduce its poverty level. Despite efforts made to improve the situation of children’s rights, Egypt has not created the circumstances for them to exercise their full rights in peace and freedom. Around 20% of the Egyptian population lives below the poverty line. Children from poor families cannot exercise all their rights such as the right to health, education, etc. Very often, the educational and medical infrastructure available to them is not able to offer them adequate services. Despite a rather high education rate, close to 94% of Egyptian children are educated, girls are often discriminated against in this area. In fact, girls are traditionally not expected to further their education. A program was recently implemented in order to promote the education of young girls and to elevate their image in society. The problem of child abuse still has a very strong presence in Egypt. Whether it is psychological, physical, or sexual, it causes severe trauma in children. They also face violence in their family, which is supposed to protect them and offer them a place of safety, as well as at school. 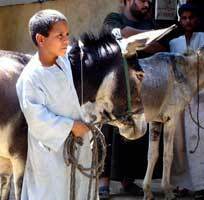 Numerous children work in Egypt: 7% according to statistics. These children have jobs, such as street vendors, cotton pickers, or even apprentice mechanics. Street children, also common in Egypt, are the most affected by this tragedy. Additionally, children from poor families who have to support the needs of their family are also forced to work. Around 17% of women between 20 and 24 admit to having been married before the age of 18. These marriages often have serious consequences on the health of young girls who do not yet understand, because of a lack of information, what marriage entails (cite an example). Since 2008, the minimum age required to marry by the Personal Status Code is 18, for girls as well as for boys. This improvement reduces the frequency of child marriages. Close to Libya, Egypt has become a haven for many Libyans fleeing violence. Often, women and children have to walk thousands of kilometres with little food and water in the hope of finding a better life in Egypt or Palestine. Numerous NGOs welcome these children and offer them psychological support so that they understand the reasons for their displacement and so that they are not psychologically affected. Practised for more than two thousand years, circumcision is still around today in Egypt. Close to 25% of women ages 15 to 49 have been circumcised. Traditionally, it is the “Daya”, or the midwife of the village, who practises these mutilations during school vacations. These mutilations have serious physical and psychological consequences on young girls. Not only traumatised by this act, some are victims of haemorrhaging and complications from this mutilation. This step, once considered a necessary step towards adulthood, is starting to disappear today, thanks in particular to the fact that it has since become a criminal offense. In some areas of Egypt, such as Sinai, families are hesitant to declare the birth and identity of a newborn. Egyptian authorities are working in this area in order to fight this troubling trend. In fact, children without a nationality encounter numerous difficulties in exercising their rights. They are then invisible in the eyes of society.